SOME of the many devices of Satan are conflict, confusion and compromise. In these areas the devil often takes advantage of us. Should there be conflict? Yes, but we need to avoid disputing about things of no consequence. Is confusion wrong? No, but we must not allow uncertainties to cloud our minds. Is compromise right and wrong? Yes it is. We must not compromise essential truth, but we must be flexible about matters of mere opinion. I wrote this editorial in the aftermath of Christmas and in preparation for Easter, both of which, as Christian festivals (ceremonies) have attracted a great deal of controversy, especially over recent times, and are in danger of being set-aside. I think it’s a device of the devil to undermine our Judeo-Christian heritage. Those who follow false religions are being used as tools of Satan to undermine a Christian foundation, which has been built up over centuries of history, and to thus make way for the anti-Christ. We know “anti-Christ” will come, so this editorial and the entire CETF 43, the first of 2008, is not intended as a preventative but ONLY as a warning and explanation. HIM we preach, warning every man, and teaching every man in all wisdom; that we may present every man perfect in Christ Jesus (Colossians 1:28). 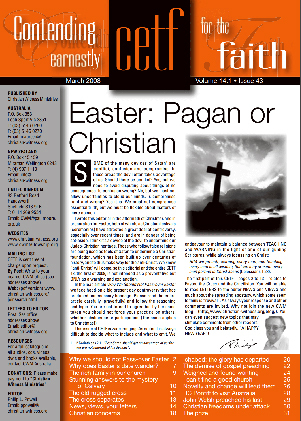 The first part of this CETF—pages 2 to 13—relates to Easter, the Cross and the Crucifixion. You will be able to read LETTERS to the editor NEWS and VIEWS and much about the spreading apostasy, which some seem to think is “revival”. As always your response and other comments are invited. Why not join the new CWM blog—(http://www.christian-witness.org/blog/). You can even suggest new topics that may stimulate comments from other readers. 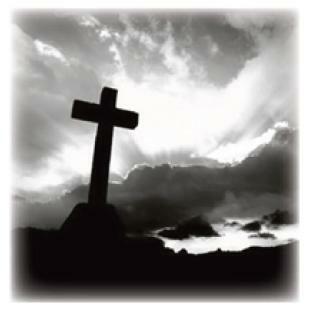 God bless you and belatedly, “A HAPPY NEW YEAR”!